The benefits of Pryzm flooring are on display at Carpet Court. Australia’s largest flooring retailer, Carpet Court, is proud to once again bring to market the latest innovation in hybrid flooring, Pryzm, a second-generation hybrid flooring that is entirely scratch, dent and stain resistant. 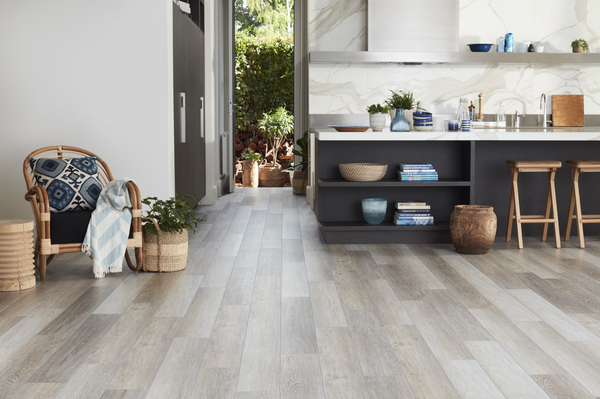 Where vinyl and tiles for high-traffic spaces have traditionally been popular choices, Pryzm opens up endless design possibilities for DIY enthusiasts and renovators, combining an Australian-first product that totally redefines flooring wear and tear without compromising on the look and feel of real timber. Created with future design trends in mind, Pryzm boasts an impressive range of finishes from traditional oak and ash, to Australian species that are sure to provide an on-trend colour choice for any interior space. Thanks to its 100 per cent waterproof rating combined with its Australian-first abrasion class rating offering outstanding durability for high foot traffic areas, Pryzm allows renovators to push their styling inspiration further and create a cohesive look that flows seamlessly throughout any space. Alongside its unique blend of design and durability, Pryzm also provides the simple installation process that is characteristic of hybrid flooring. With minimal subfloor preparation and no acclimatisation period required, plus pre-adhered underlay and the same simple click locking system as laminate, Pryzm is ideal for those looking to give their interiors a quick and stylish refresh by themselves. And for those tackling a full-scale renovation project, Pryzm is also capable of coping with the full suite of home applications. Homeowners can visit Geelong Carpet Court to discuss their flooring needs and view the store’s full range or visit carpetcourt.com.au to discover more trends and inspiration. Find Carpet Court on Facebook at facebook.com/CarpetCourt and on Instagram at @carpetcourtau or search #CarpetCourt.